We took a little journey over the last few days and visited South Dakota so I've not had a chance to post on my blog lately. My great-aunt passed away last week, and we wanted to to offer our condolences to her family. My grandmother grew up in South Dakota and it has been several years since I've had the chance to travel to the area and visit with relatives that live there. The kids enjoyed the trip even though it meant some long hours in the car. My daughter told me tonight that she wants to go on more adventures. 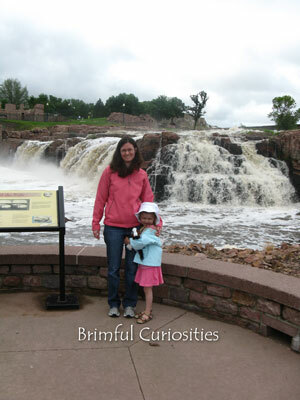 She especially liked viewing the waterfall in Sioux Falls and listening to the water roar over the rocks. Find more of this week's Wordless Wednesday (or Wordful) posts at 5 Minutes for Mom or Seven Clown Circus. Sorry for your loss. It's nice you were able to go and visit relatives out there though! I'm sure it was nice for your children too! I'm sorry about your aunt :( I'm glad you had a nice trip though! Sorry about your Aunt. Glad you were able to spend some time with family and enjoy your time there. Nice pic! Sorry to hear about your great-Aunt. That park looks like a beautiful place to visit. We're wanting to go to South Dakota soon. It will be next years trip I think. So fun! Sorry about your Great Aunt, but it looks like it gave you all an opportunity for an adventure. Which is always fun (I hope). I have been to Hill City SD several times. Beautiful country! So sorry for your loss. But it seems out of something so sad came something so sweet. I hope you and your family enjoy many more road trips. Sorry about your loss, but it was smart of you to take advantage of the trip. I'm so sorry about your great-aunt. The photo of you and your daughter is adorable though. beauty in nature seems to help in hard times. What a great place to take a photo! So glad she saw it as an adventure.